Discover below the many trails presently marked and our mission TO continue to Mark and PRESERVE THE historic Pioneer TRAILS! Like to join Us? Click here to become a member! Here an "Iron Cross"—a sturdy marker made from steel rail is placed along the Hastings Cutoff of the California Trail. The Donner-Reed Party used this portion of the trail and it is often given their name. There is a possibility, currently under investigation, that graves from early in the trails era are near this spot. This marker is not on the trail per se but is on a bench a few hundred feet above the valley floor at Timpie Point. This is the place many historians believe fur trapper and explorer Jedediah Smith came in 1827 after crossing Nevada from California and first caught site of his beloved Great Salt Lake and Wasatch Mountains. For this party of trail explorers and markers it was the perfect place for lunch. Left to right are George Ivory, Greg Childs, Vern Gorzitze, Mike Tea, Boyd Blanthorn, Roy Tea, Ed Otto's son Wes, Jeff Carlstrom, Oscar Olson, Ed Otto and Steve Berlin. Larger (300K) version photo, click here. Vern Gorzitze, OCTA board member, and Jeff Carlstrom, Crossroads Archeology chair, wrestle one of the the heavy steel markers into place. A tractor was used to bore the holes, heavy stones were placed and concrete was made at the sites to anchor the posts permanently. The manpower came in very handy for accomplishing all the necessary tasks. Marking the Hastings Cutoff / Donner-Reed / Great Salt Desert Trail. Donner Springs and Pilot Peak are in the background. These last ten miles of the trail before reaching water after traveling nearly a hundred miles without a well or watering hole were the scene of great suffering by the pioneers and their animals. Nevertheless, hundreds made it across this portion of the cutoff before its reputation for extreme hardship made it fall out of favor even with those looking for the shortest possible route to California. Rocky Ford of the Malad River in Utah near the Idaho border on the Salt Lake Cutoff of the California Trail. Made near Plymouth, UT. 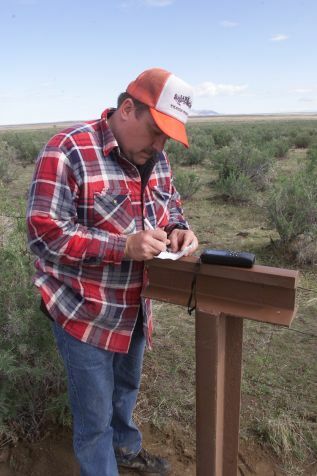 Ed Otto, Crossroads Preservation Officer, uses a handheld GPS unit to record the position of this marker. GPS promises to significantly improve our ability to map the trails and locate cultural resources and monuments. Stainless steel plaques have been prepared with brief histories of the trail in the area of each marker. They are riveted to the crosswise piece of rail and are expected to be both informative and resistant to vandalism. 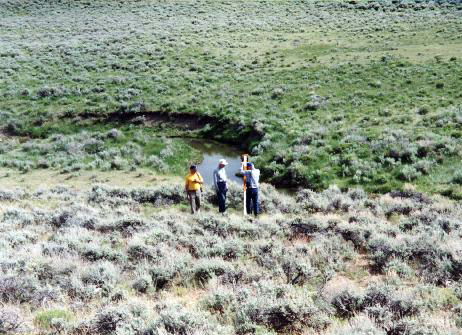 Utah Crossroads Chapter members placing Carsonite posts on the Salt Desert Trail (Hastings Cutoff and Donner-Reed road) East of Silver and Floating Islands. Travel back in time and experience the adventure as three interns retrace the fateful steps of the Donner-Reed Party, traveling the ninety-mile waterless stretch of the California Trail known as Hastings Cutoff. This alternate route included this section across the southern end of the Great Salt Lake Salt Flats. First Overland Emigrant Party "... 5 miles took us to this place, where we found, to our great joy, an excellent spring of water and abundant grass. Here we determined to continue, "till the route was explored to the head of Mary's River..." - John Bidwell, August 27, 1841. "Traveled 16 miles today and camped on Echo Creek. A berry resembling a Black-Currant grows here in great quantities." "After travelling 6 miles this morning the Company came to a halt. The Oregon Company were now going to leave for Bear River for Ft. Hall,...here included to go into Oregon so that the California Company now consisted of only 32 men and one woman and child, there being but one family. The two companies, after bidding each other a parting farewell, started and were soon out of site." - John Bidwell, August 1841. Pilot Peak is part of the 1846 Hastings Trail. The Donner party traveled this route. The few who came through this dangerous trail used Pilot Peak as a guide across 80 waterless miles. "Travelled but a short distance when we discovered that a deep salt creek prevented our continuing near the river. In descending this stream in search of a place to cross it, we found on its margin, a hot spring, very deep and clear." - John Bidwell, August 1841.